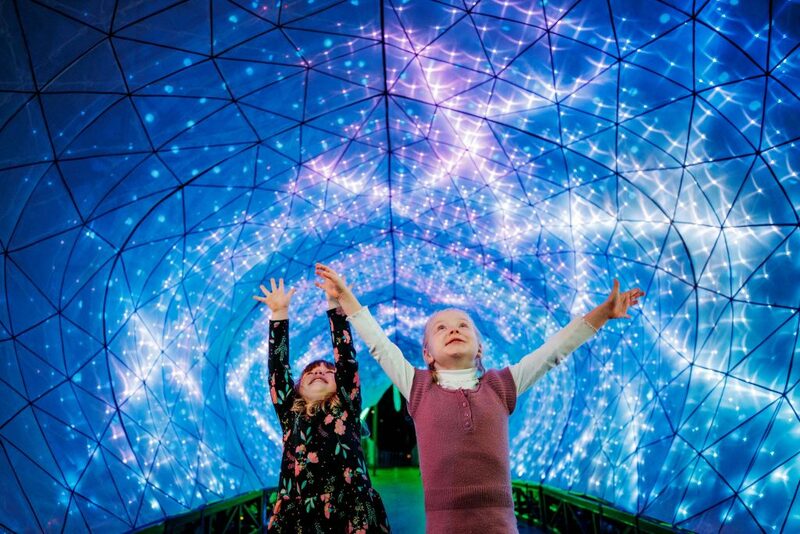 Now in its 9th year, Vivid Sydney is spreading the light fantastic to more precincts than ever before, with 90 brilliant light installations and projections across the city. While you can pick out special events through the program found at one of the Vivid information booths or online, there is a great deal of emphasis on family friendly events. The city comes alive at night, from the ever-evolving colour projections on the Sydney Opera House which run from May 26 through June 17, to clever installations at Barangaroo, Darling Harbour, Royal Botanic Gardens, Martin Place, Kings Cross, the Carriageworks in Redfern, Chatswood and Taronga Zoo. There are also more than 400 music events and over 280 idea sessions with world-class disruptors and thinkers. Vivid has always been about the creative lights, as they provide a colourful signature for the event. It is the world’s largest festival of lights, music and ideas. The Vivid Light Walk around Circular Quay. Lights come on at 6pm and go black at 11pm every night through the festival. The walk is free. 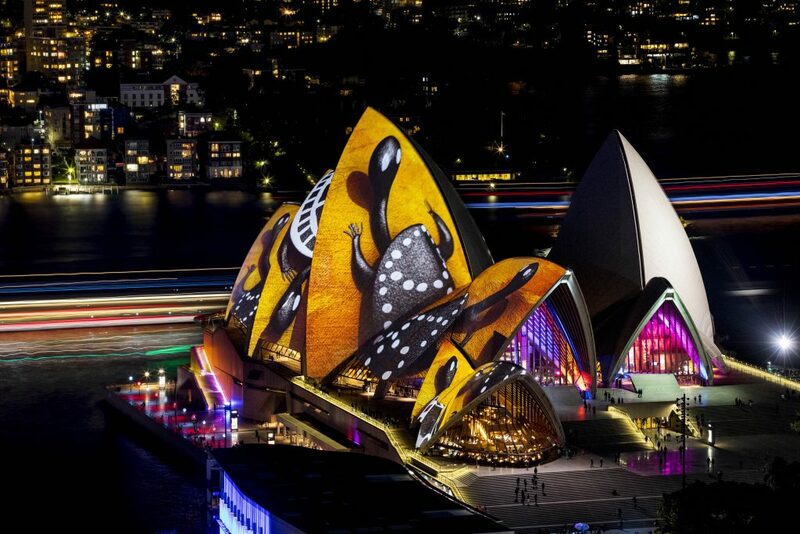 The highlight is the Lighting of the Sails on the Sydney Opera House but several other structures are illuminated as well. And if you get hungry, head to Song kitchen for our express dinner. Enjoy a two Course Dinner with a glass of wine for $40 per person. Available from 5.30pm to 9.30pm Tuesday to Saturday when ordering two courses. Expect large crowds on the weekends. Free ID wristbands are available at Vivid information booths so you can write your name and phone number on them and attach them to your children in case they get lost in a crowd. Darling Harbour. Lasers, foundations, flame jets, music and fireworks are featured in the Magicians of the Mist theme around Darling Harbour. Barangaroo South. This new area is featured in Vivid for the first time, with fantastical floor murals and scene swaps portraying the theme Trapdoor, in an optical illusion of the mysterious underworld. Royal Botanic Gardens. The Electric Forest will show off illuminated plants, from wild hanging fruits to school of fish. Other highlights at the gardens include the Dipping Birds – the 2-metre tall birds bob up and down seeking a drink, and change colour when they sip – and Sunflowers that bow as you pass them at night. 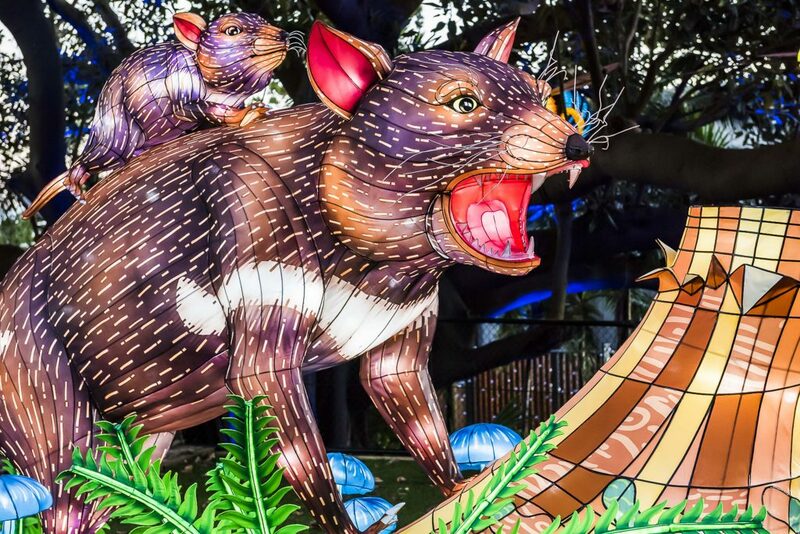 There will also be illuminations at Taronga Zoo on the north side of Sydney Harbour and in the Reflection Pool in The Concourse in Chatswood, easily accessible on the north shore train line. 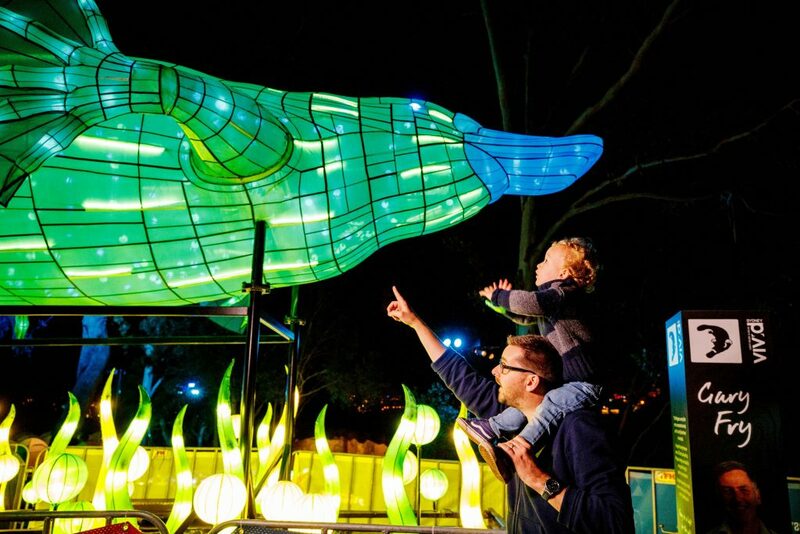 Taronga Zoo will feature a trail of giant light sculptures of endangered animals at night and a 20-metre walk through a giant Port Jackson shark installation. Kings Cross is also included this year, and various venues will feature adult-oriented music and arts events. For the first time the Coca-Cola billboard at Kings Cross will feature a series of projections, with a series of black-and-white portraits of local characters photographed by award-winning photographer Katherine Williams rotating on the huge sign. The Coca-Cola LED billboard will offer a continuous light show for the entire 23 nights of Vivid. Kings Cross Hotel, with six floors of dancing and DJs; Crane Bar, Darlinghurst, operating Murder on the Dance floor with food, music and special cocktails. The World Bar, featuring a cabaret of “Hidden Sydney” and separate talks on the wild good ‘ol days of the Cross.